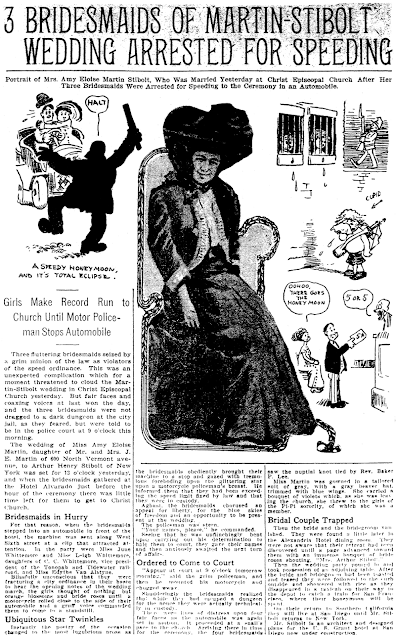 October 15 1909 -- In a case study of how to make a mountain out of a molehill, the reporting, cartooning and photography powers of the LA Examiner are brought to bear at full force over a speeding ticket. This was such a waste of time that I refused to spend time cleaing up the headline area. 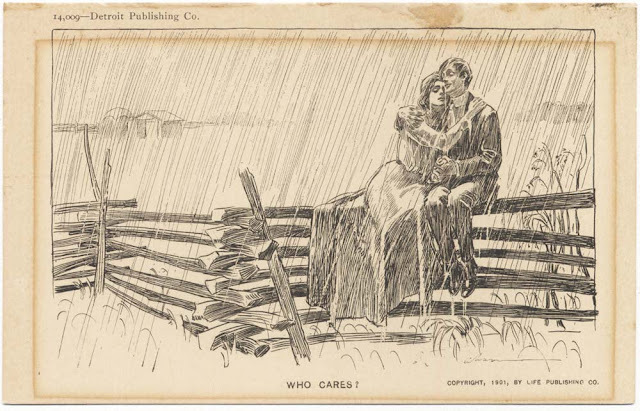 Here's another in the Detroit Publishing Company's C.D. Gibson series, this one #14009. This is another card from this series in my collection that has a blank back -- misprint, off-print, who knows? Who cares? 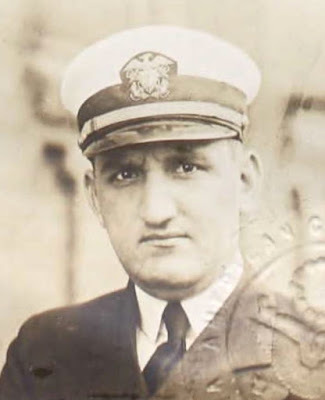 Frank Victor Martinek was born in Chicago, Illinois, on June 15, 1891, according to his World War I and II draft cards and a 1920 passport application. However, the birth year in Social Security Death Index is 1895, and the 1900 U.S. Federal Census said 1894. In the 1900 census, Martinek was the oldest of two children born to Frank and Mary, both Bohemian emigrants. The family resided in Chicago at 2622 Fifth Avenue. According to the 1910 census, the Martinek family of four and a servant lived in Chicago on West 38th Street. Martinek’s father was in the restaurant business. With a job as copy boy on the old Chicago Record-Herald, Martinek began his adventurous career. As a cub police reporter he met Mrs. Mary Holland, celebrated woman detective, who schooled him in scientific criminal identification. He studied finger-printing and left newspaper work to become identification inspector for the civil service commission. Unable to stay at a desk, Martinek answered the call of excitement and took to sea and then found himself in many far corners of the earth as a soldier of fortune. In 1917, he organized the physical, chemical and photographic laboratory for the office of naval intelligence in Washington and was commissioned an ensign…. On June 5, 1917, Martinek signed his World War I draft card which had his full name and home address, 3431 Lowe Avenue in Chicago. His occupation was identification inspector for the city of Chicago in its service commission. His description was medium height and build with dark brown eyes and hair. Martinek was aboard the U.S.S. Albany, in Vladivostok, Siberia, when the 1920 census was enumerated in March. His stateside address was 2212 Addison, Chicago. 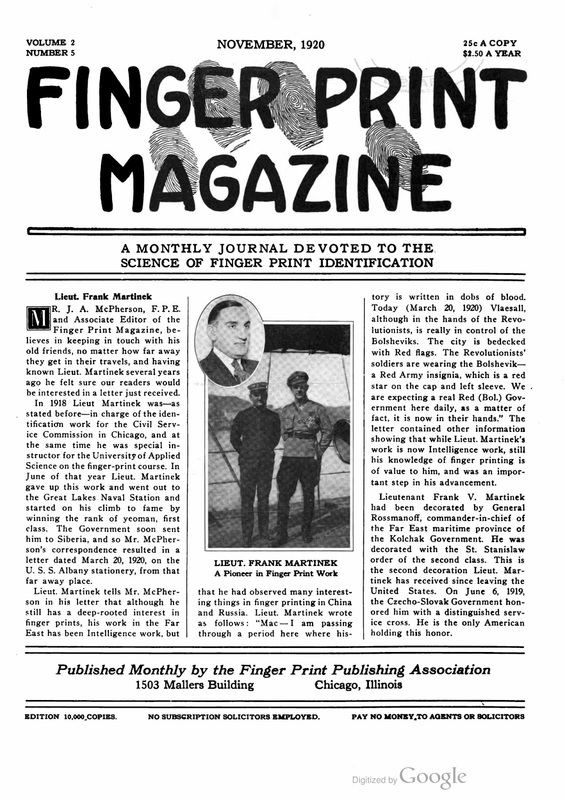 Finger Print Magazine, November 1920, published additional information about Martinek and excerpted a paragraph from his letter written in Siberia. On August 10, an emergency passport was issued to Martinek by the American Consulate in Vladivostok. The passport said Martinek left the U.S. in October 1918 and was stationed with the U.S. Asiatic Fleet. When Martinek signed the passport, he was a U.S. Navy Lieutenant aboard the U.S.S. New Orleans. Bound for the U.S., Martinek intended to visit the following countries: China, Japan, Honk Kong Strait Settlements, Egypt, Italy, Czechoslovakia, Switzerland, France, Belgium and the Netherlands. The District of Columbia, Compiled Marriage Index, at Ancestry.com, said Martinek married Victorine A. Carrick on December 24, 1920. 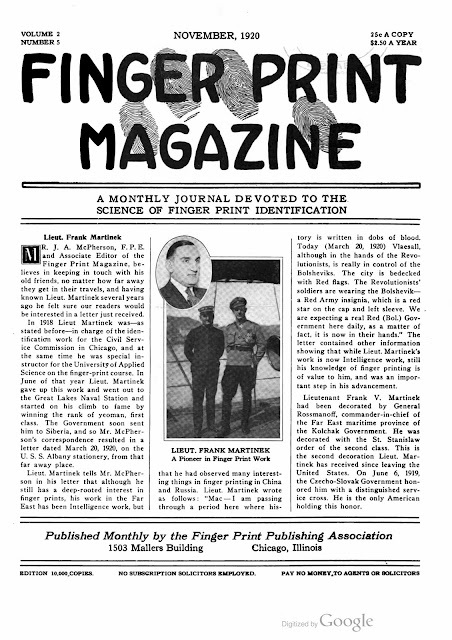 Martinek worked for the Federal Bureau of Investigation from 1921 to 1925 as listed in the Society of Former Special Agents of the Federal Bureau of Investigation’s membership directories for 1949 and 1950. A passenger list at Ancestry.com listed Martinek aboard the S.S. Cerro Ebano that sailed from Aruba, Dutch West Indies on May 4, 1929. He arrived at the New York City port May 11. Martinek’s address was 1400 Lake Shore Drive, Chicago. In the 1930 census Martinek and his wife resided in Chicago at the Double Apartment Hotel Building on 3270 Sheridan Road. Martinek was a vice-president at an oil company. Coulton Waugh wrote in his book, The Comics (1947), that Admiral Wat T. Cluverius, Commandant of the Great Lakes Naval Training Station, told Martinek about the recruiting difficulties in the central section of the country. Martinek pondered the challenge and took his book creation and hero, Don Winslow, and turned him into a comic strip. Colonel Frank Knox, who was shortly to become Secretary of the Navy, became interested and helped sell the idea to the Bell Syndicate…. “Three years ago,” Commander Martinek wrote in 1945, “Carl Hammond, our layout and research man, went into war work, being single and within draft age. Leon Beroth and I have carried on ever since…. American Newspaper Comics (2012) said Don Winslow of the Navy ran from March 5, 1934 to July 30, 1955. Beroth was followed by John Jordan. Spun off from the successful comic strip were a movie serial and comic book appearances. The 1940 census said Martinek and second wife, Clara, made their home in Tucson, Arizona, at 80 North Stone. Clara did research work on a newspaper strip. Martinek signed his World War II draft card on April 27, 1942. His home was in Chicago at 4940 East End Avenue. His employer was the Standard Oil Company, 910 South Michigan Avenue, Chicago. The same address was found on passengers lists from 1953 (Honolulu, Hawaii) and 1955 (Buenes Aires, Argentina). Martinek passed away February 22, 1971, in Tucson, Arizona. He was laid to rest at All Faiths Memorial Park. The Don Winslow comic strip began in March 1934, sailing into newspapers under the command of writer Frank Martinek and artist Leon A. Beroth. 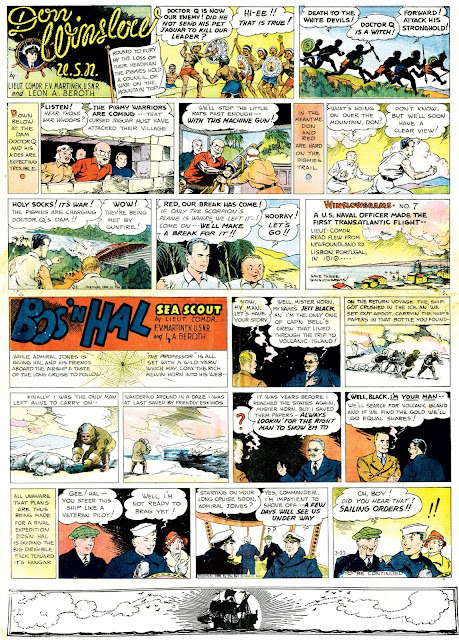 Martinek created the strip in order to publicize the U.S. Navy, hoping that the glorification it received in the strip would lead to more recruits signing up for the service.To that end, Winslow engaged in dramatic adventures against spies and saboteurs all over the world, just exactly like the typical Navy recruit would. The strip, distributed by Bell Syndicate, enjoyed a very good launch and it wasn't long before Winslow's adventures were the the subject of Big Little Books, radio shows, movie serials and comic books. Naturally a Sunday page needed to be added to the mix, and it debuted on April 21 1935*. As was the case with a few other Bell strips, the Sunday page was divided in half, with the topper equal in size to the main strip. Martinek came up with a separate Sunday adventure hero named Bos'n Hal, Sea Scout. I haven't seen the earliest Don Winslow Sunday pages, but I presume that Bos'n Hal started at the same time as the main Sunday strip (can anyone lend a hand on that important point?). A Sea Scout is apparently a special sort of Boy Scout who specializes in boating activities. Although Hal looks considerably older than Boy Scout age, I gather that's how he started out. It wasn't long before Hal made it out to sea as an observer on a Navy ship, and from that start his adventures began. Unlike Winslow, who mostly kept evil-doers at bay, Hal's adventures tended to be lighter fare centered on treasure hunting and exotic locales. Although Martinek was credited for writing the strip, most of the material was apparently written by Carl Hammond through 1942. Hammond was semi-officially credited as the "layout and research" man, although he never got a byline on the strip itself. As for the art, Beroth was apparently assisted by Ed Moore, and the pencilling on Bos'n Hal was turned over to him entirely, according to Ron Goulart. This most likely would have been from 1938 (when Moore stopped assisting on Dan Dunn) until 1940 (when Moore got his own sea-faring strip, Captain Storm). The Bos'n Hal topper was cancelled with the Sunday of December 15 1940**, probably because Ed Moore was leaving. The decision seems to have been made pretty quickly, because the final Bos'n Hal strip offers up the ultimate groaner of a conclusion. Hal is drowning as a volcanic island sinks under the sea, and then he wakes up and is told that all of his adventures have been a dream. Stayed tuned for Alex Jay's Ink-Slinger Profiles of the Don Winslow creators, coming up this week and next. * Source: Jeffrey Lindenblatt based on Brooklyn Times-Union. That final Bos'n Hal strip reminded me of the last Ace Drummond strip that came out earlier of the year!!! That one also ended up in a dream!!! The final strip mentions that the dream started when Hal fell overboard from Captain Gawk's ship. That was shown in the final panel of the March 10, 1949 strip. So everything from March 17, 1949 to December 8, 1949 was a dream but everything prior is unaffected and "real". When a heart problem induced Dr. Scott Henson to retire from medical practice in his 40s, he made a less than obvious choice for a new career - cartoonist. Henson came up with a cartooning pseudonym -- Russ Wallace* -- and took his considerable cartooning skills to the Charleston Gazette, where he was offered a job as their editorial cartoonist. Henson/Wallace's style owed a lot to the likes of Jeff MacNelly, but his work was so strong that the term 'derivative' seems unfair. Despite his medical condition, Wallace was not content to be 'just' an editorial cartoonist, but took on another major assignment when he succeeded in getting a daily and Sunday panel cartoon titled Natural Selection accepted by Creators Syndicate in 2000**. The new panel offered edgy gags that owe a little to Gary Larson, as well as another of henson's cartooning heroes, Charles Addams. Henson gave up the Sunday version of Natural Selection on December 29 2002, but the daily continued in a small but respectable number of papers until June 30 2007 (with reprints distributed until July 28 2007)***. It is unclear if the plug was pulled on the panel due to low sales or if Henson's health had become too much of an issue. Henson died in June 2012 at age 52. * Henson chose this name as an homage to Alfred Russel Wallace, who discovered the concept of natural selection independently of Charles Darwin in the 1850s. ** Specific start date is unknown. St. Louis Post-Dispatch starts it on November 6, but promo article they ran that day sort of says it was already in syndication by then. noted "the panel's > penultimate < cartoon of July 27, 2007." I wrote to Henson/Wallace during the middle of his comic's run. He was evidently jumping in on his cartoon career despite his health, because he told me he was trying to get a second comic syndicated, about talking dogs. He said a syndicate was interested, but it never got off the ground for some reason. T.S. Allen did very well with his various kid strips and panels, but by the late 1900s he'd lost favor at the major New York papers and was reduced to selling his wares at the likes of NEA and the Philadelphia Press. 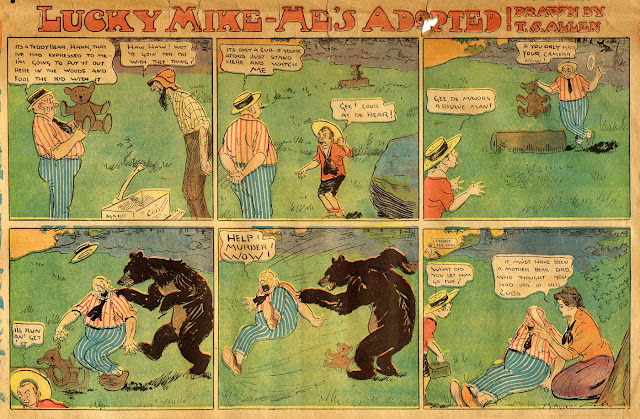 One of his last series is Lucky Mike, produced for the Philadelphia Press from March 15 1908 to February 19 1911*. It concerns a street urchin kid, which is practically required in an Allen strip, but this kid has been adopted into a well to do family. Mike's main foil in his new family is 'the Major', a grandfatherly type who tries to be a mentor to the kid with uniformly unfortunate results. The Major became a billed co-star after May 30 1909, when the title was changed to variations of Mike and the Major. 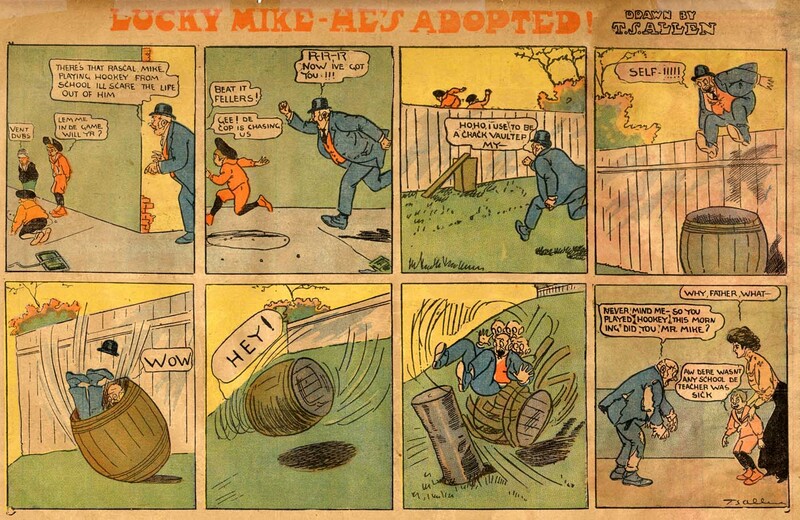 In 1908-09 Lucky Mike was licensed by the Press to McClure Syndicate, which ran it in one of their readyprint sections. Allen seemed to be serving up some sort of bizarre slang in that second example above -- can anyone decode the meaning of "VENT DUBS" and "CHACK VAULTEP"? * Source: Philadelphia Press. Mark Johnson presents in the comments a strong case that I missed the real start of the strip on 3/8/09. It's a little tough to make out on the printing, but I think the Major is saying he used to be a "crack vaulter" himself -- that is, someone who used to be really good ("cracking") at jumping over fences. He used the actual PRESS files. I notice the second week, the size was only (1/4), to accomodate a premium promotion ad. Thanks Chris and Paul for untangling that obscure marbles jargon and bad lettering! Mark, my start date is from the Press microfilm at the Philly Free Library. My indexing notes for 3/8 have Harry, Rummage, Poor John plus the McClure strips Wags and Bub. Then on the 15th Mike is added without losing any other strips. Unfortunately I wasn't marking strip sizes so I don't know how it fitted in. Was the microfilm missing a page? As every page is accounted for, I will say that no pages were missing in any of the 3/08 sections. Cole's capsule designation for the 15th's Lucky Mike is : (Gang pushes him in mud). The ad next to it was for the Standard Publishing Co. of Passaic, NJ. Since the Press only (frustratingly) used boiler plate headings, Cole had to add the short episode designations. Apparently the Press syndicate was only offering two pages of material by 1908, usually four half page strips intended as inside pages for a client 's section. I think the other two pages were the McClure stuff and maybe Polly Sleepyhead or something like that. So what you have for the 8th that is, of Press-generated items, you didn't take down the Lucky Mike entry, it had to be under the Harry in the second page and you've left that half page unaccounted for. It could be that another paper in the same cities had the other Press page. I've seen this happen with North American, WCP and even Hearst titles. Some papers only took one of the four Press offerings, namely Hairbreadth Harry, which I've seen in a Baltimore paper and a Tacoma one, filling the remainder of the page with story copy or one column cartoons and jokes. I have a theory that when a strip appeared in 1/4 size in Philly, to accomodate an ad, the clients would not necessarily run that ad or any ad, and would need a regular 1/2 page strip. Therefore, perhaps the 1/4 size episode would never be seen outside of the Press itself. What that alternate strip might have been I don't know. The Press seems to be a second rate organization, maybe they just recycled an old strip. I can't think of another paper that took all the Press stuff. They had a cover page in those days, at least until 1907, but they seem to be the only ones that ever used it. Cole was as precise as he could be, so it would seem that there indeed was a Mike on 8th March, and he described it as the Debut. So for what its worth, it would be the right date to me. He made those notes almost forty years ago, and after all this time,they're actually being used for something.